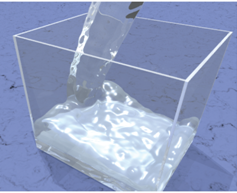 We propose a new fluid modeling technique aimed at incorporating stochastic turbulence into a widely used Lagrangian fluid solver, the Smoothed Particle Hydrodynamics (SPH) method. We add to each SPH particle a swirling probability to model its likelihood to act as a swirling incentive particle (SIP). Particles are selected as a SIP randomly based on the probability, and a SIP spins its neighboring particles to rotate around itself by applying rotational force. The force is computed from a swirling vorticity of the SIP. We model the production, development and spreading of the swirling probability and vorticity among all SPH particles. The algorithm inherently implements preferred turbulence evolution including vortex aggregation and decay. The turbulent effects are non-repeating and easily controlled by animators. Our method is fully integrated with the SPH scheme with minimal extra memory usage, computational load and programming efforts. 1. Snapshots of a moving object inside a water tank along different time steps (a)-(d). Top: Original SPH simulation; Bottom: With introduced turbulence. Download video. 2. Water Stream with Obstacle-induced SIPs: Download video. 3. Water Pouring into A Tank: Download video.